Hollywood, the Diamond of the Gold Coast is a one of the biggest cities in the U.S. state of Florida. It is a bustling city with unparalleled charm and beauty. Although there is a popular city with the same name in Los Angeles, California which is famed for its urban vibe and celebrities, but this Hollywood which is located in the U.S. state of Florida is no less. It is a beach town in the sunny state with plenty of activities, like eco-tours, parks, beaches, Hollywood trolley tours, art and cultural centers, nightclubs, shopping and fine dining establishments, and all this add to the reasons to plan a holiday trip to Hollywood, Florida. Another major reason to visit Hollywood is the weather. It receives plenty of sunshine and rainfall too. 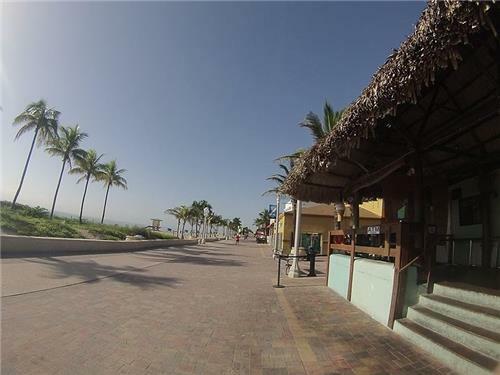 You can relax on the Hollywood Beach in the sun and enjoy the weather from November until April. The city also goes heavy on revelries. But, one thing to keep in mind always before planning a holiday trip is the weather. Every season has different climatic conditions, so it is really important to choose the perfect time to explore and experience the assets of Hollywood in order to have a wonderful trip. To help you make the right decision, we’ve compiled all the information- best time to visit, clothes to pack, events and festivals, and average temperatures. Spring season in Hollywood is pleasant and an ideal time to visit. It is sunny and perfect to lie on the beach, soak up some sun, enjoy the gentle sea breezes and indulge in water sports like kayaking, surfing, canoeing, etc. The humidity level is extremely low. You can amble around the town without fretting about the weather. Light rains may occur, but nothing to worry about. The city attracts hordes of tourists this season and the hotel rates are steep, too. Average high temperature during spring season in Hollywood is in 80s and average low temperature is in 60s. Summer season in Hollywood is hot and sticky, and receives ample rainfall along with occasional hurricanes and tropical storms. If you fret about searing heat, avoid coming to Hollywood around this time of the year. The heat late 80s degree heat coupled with heavy rainfall and thunderstorms and summer break crows makes Hollywood a little less desirable. But, on the plus side, the hotel rates are low and many great deals are up for grabs. Average high temperature during summer season in Hollywood hovers between 80s and 90s and average low temperature is in mid-70s. Fall season in Hollywood is hot and humid with thunderstorms and no cessation of rainfall. Also, this season is susceptible to hurricanes. On the upside, the hotel rates are affordable and the crowd is less. Average high temperature during fall season in Hollywood is in 80s and average low temperature is in 70s. Winter season in Hollywood is mostly sunny and warm with comfortable temperatures. Though, it experiences cold snaps but not very often. The nights may be a bit cold. It is a great time to roam around the city, stroll along the broadwalk and engage in outdoor fun activities as it is indeed a wonderful weather outside. Tourism is in full swing and tourists keep on pouring in during this time of the year. The hotel prices are steep so book in advance. Sidewalk cafes and beachfront restaurants and bars are packed with locals as well as transplants. Average high temperature during winter season in Hollywood is in 70s and average low temperature hovers between 50s and 60s.